Join us for encouraging Sunday morning worship at either 8:00 or 10:30 a.m.! Our congregation adopted a new strategic focus statement. This statement is as follows: Together we commit to build purposeful community through the DRAMA of the gospel of Jesus Christ. Discipleship/Reconciliation/Ambassadorship/Mission/Authenticity We are excited that God has continued to sharpen our focus around these key words and has led us to emphasize the importance of building communities of people that experience and advance these words in our church family. 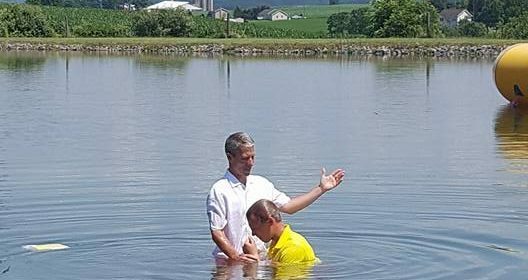 We praise the Lord that 16 people were baptized in the Keister pond on a beautiful Sunday, July 16. Additionally, 13 people became members through transfer of letter or reaffirmation of faith. We rejoice that God is growing our church family and we welcome these new members.